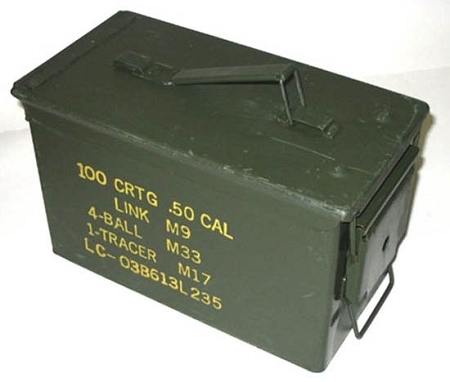 50 Cal Ammo Boxes!! Genuine Government Issue! Used 50 Caliber Ammo Boxes!! They have a hinged top, carrying handles and are designed to accommodate and store a ready supply of ammunition and hold the ammunition while the gun is being fired! Also can be used for storage of almost anything! They are used: conditions may vary. Outside of the can may have light exterior rust from storage, small paint dings, and/or surface scratches from storage. The inside of the can will be free from rust and/or paint. The lid will be fully functional with all pins and watertight rubber seal.